Hidden Valley Nature Trail is a 1 mile moderately trafficked loop trail located near Twentynine Palms, California that features beautiful wild flowers and is good for all skill levels. The trail offers a number of activity options and is best used from March until October. 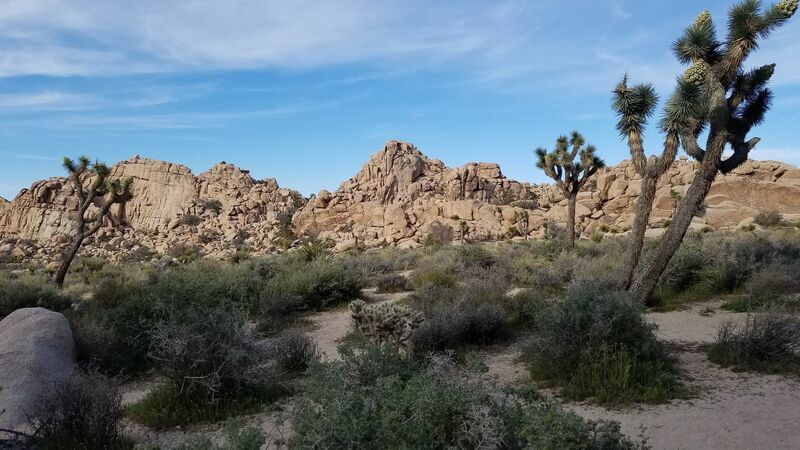 Sample the best of Joshua Tree National Park on this short 1 mile nature trail loop in the heart of the park. 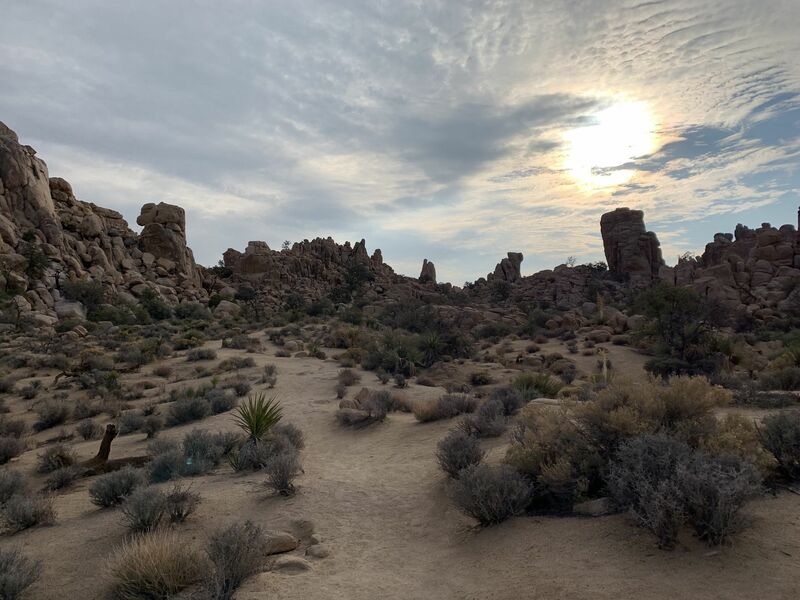 If time or the fierce sun means you only have the chance for one short hike at Joshua Tree National Park, then Hidden Valley is a great choice. 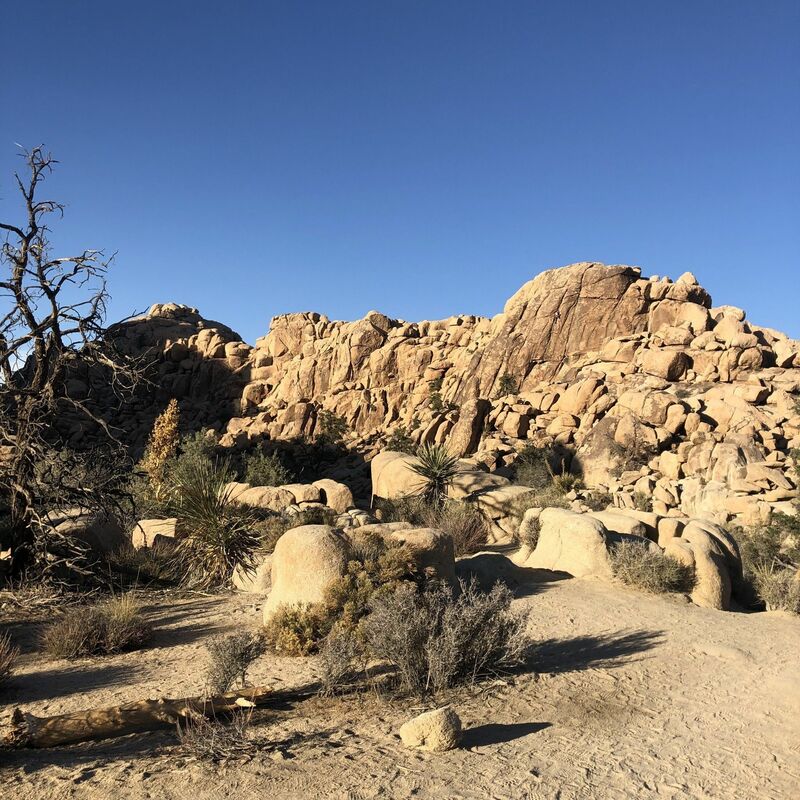 Encircled on all sides by the familiar golden rock outcroppings of the Joshua Tree park, Hidden Valley certainly lives up to is name. 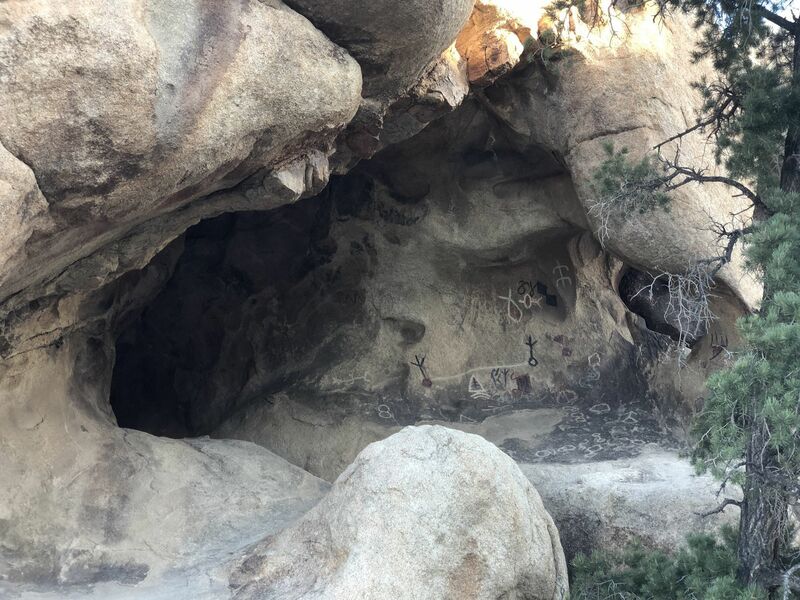 In addition to being a great sheltered location, this place is also rumored to have been well known to 19th century cattle rustlers who would hide their bovine hoards in here. 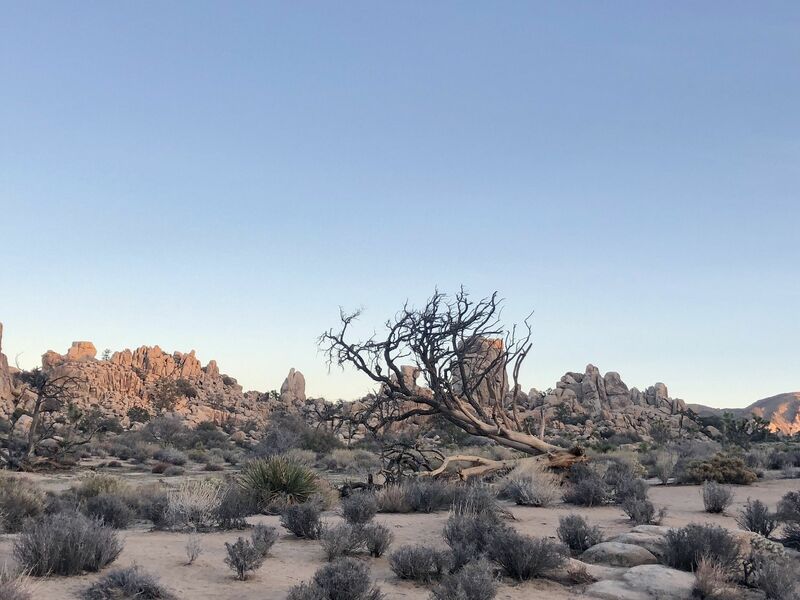 The nature trail takes you on a circuitous route around some of the most prominent features of the park, including interpretive guides to the area's diversity, plant life and geology. 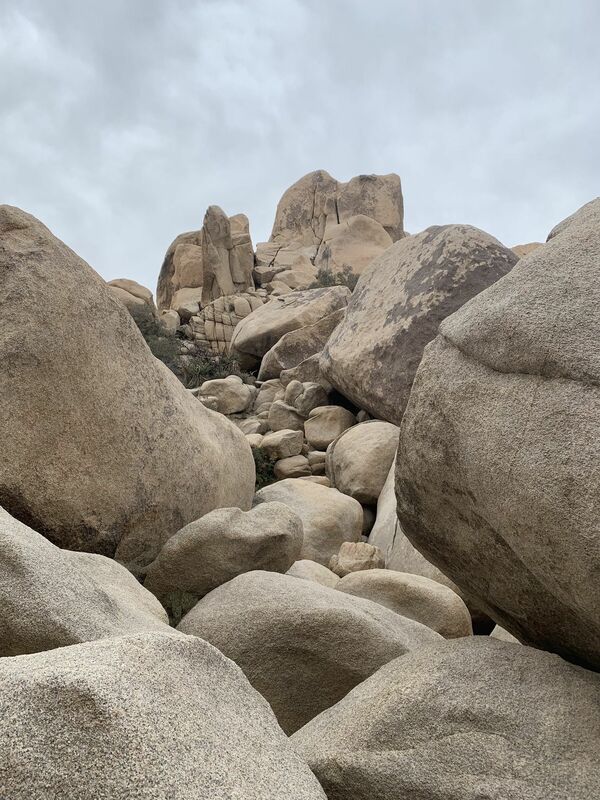 Begin the hike at the Hidden Valley trailhead located just south of the main park road, near Intersection rock, where you'll commonly find rock climbers doing what comes naturally to them. This short guide begins at the parking lot, marked out by a roped entrance. Follow the trail into the valley with a brief gentle climb up across rocks and down onto the level valley floor. 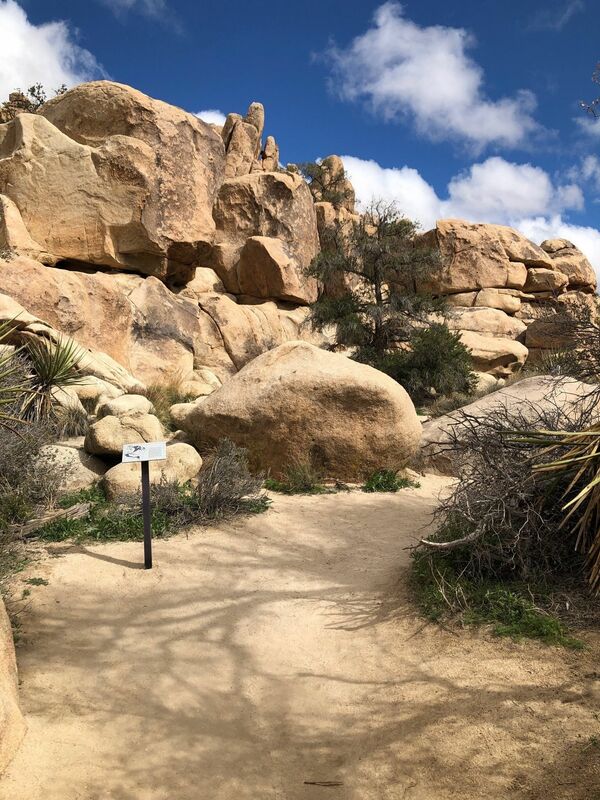 Though the signs don't recommend a direction at this point, everybody we observed on this popular trail took a clockwise route, and we're happy to believe in the wisdom of crowds. 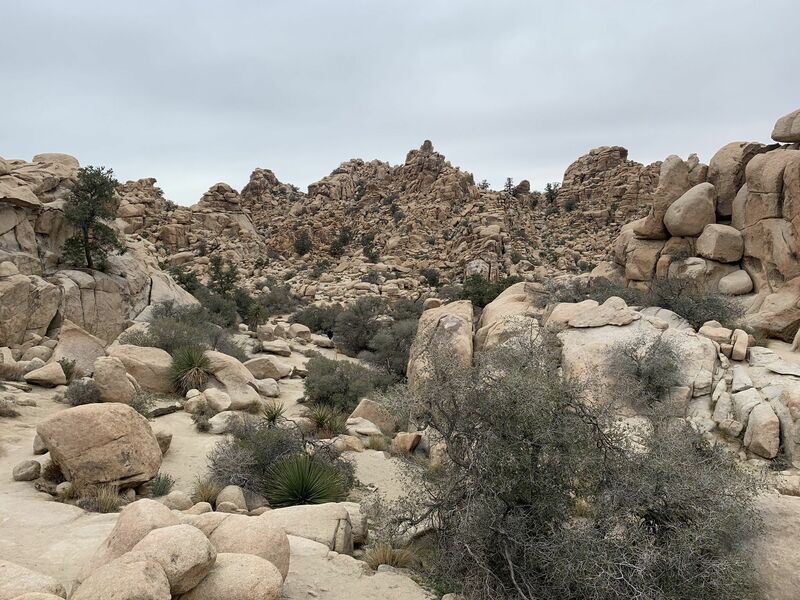 The majority of this hike is along the sandy valley floor, making for an easy and comfortable experience. 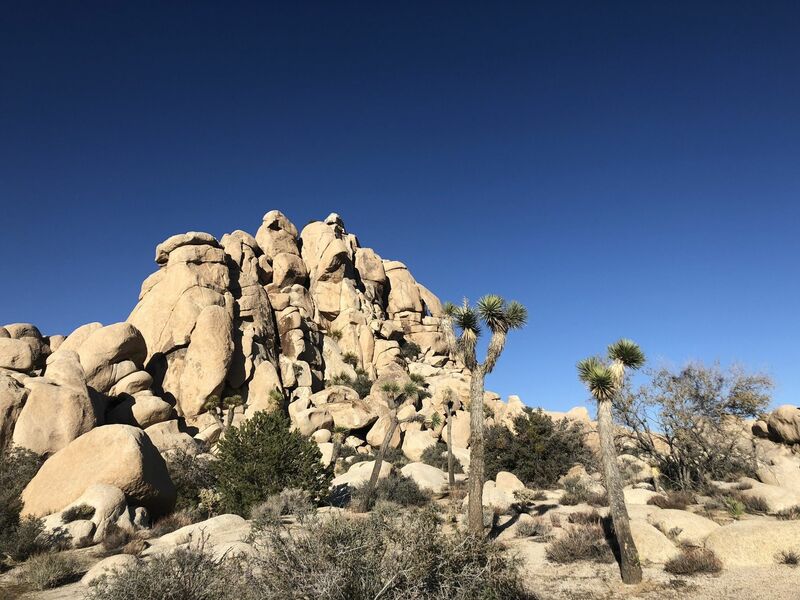 The distinctive rock formations of Joshua Tree National Park are comprised of a granite material which originally formed from molten lava underground. 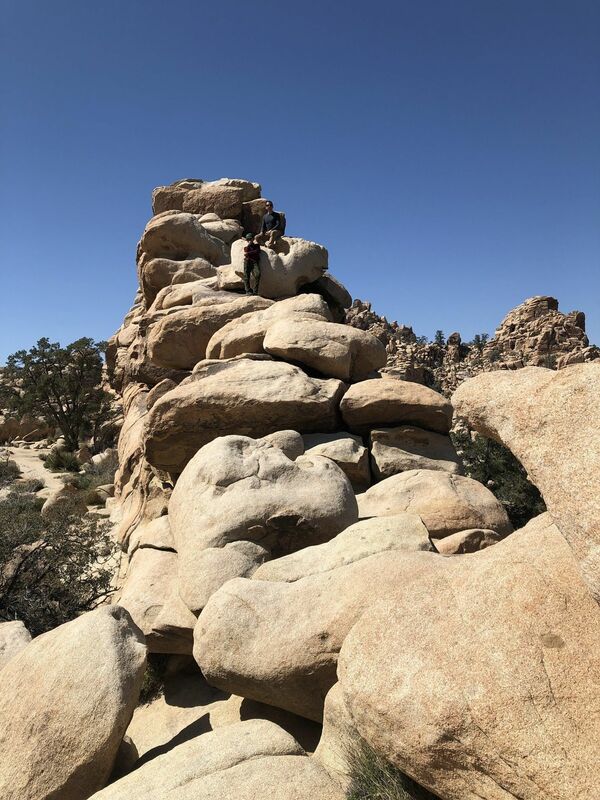 Over a million years of erosion - mostly occurring before this region became a desert environment - washed away the surface material and weathered away at the fractured granite seams, leaving behind these impressive stacks of rocks. 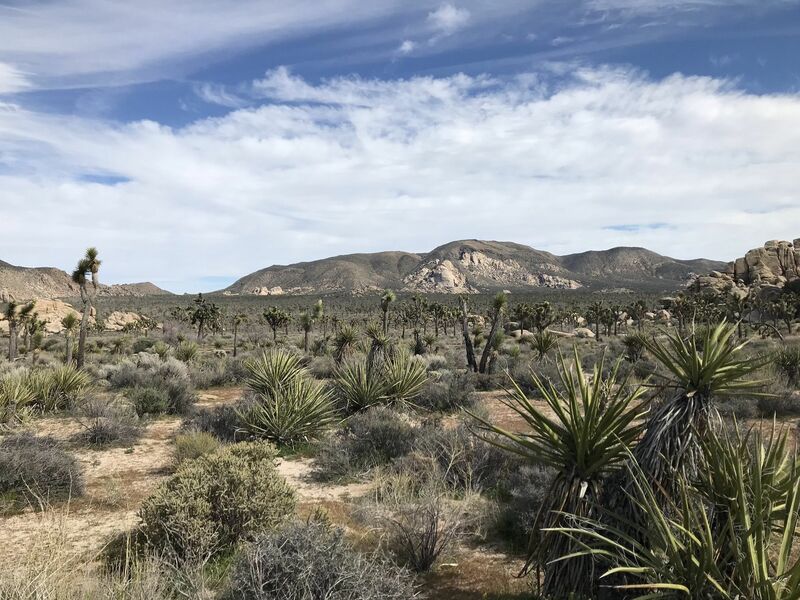 Keep your eyes peeled for dykes - including one called out by an interpretive sign in the northeast side of the valley. 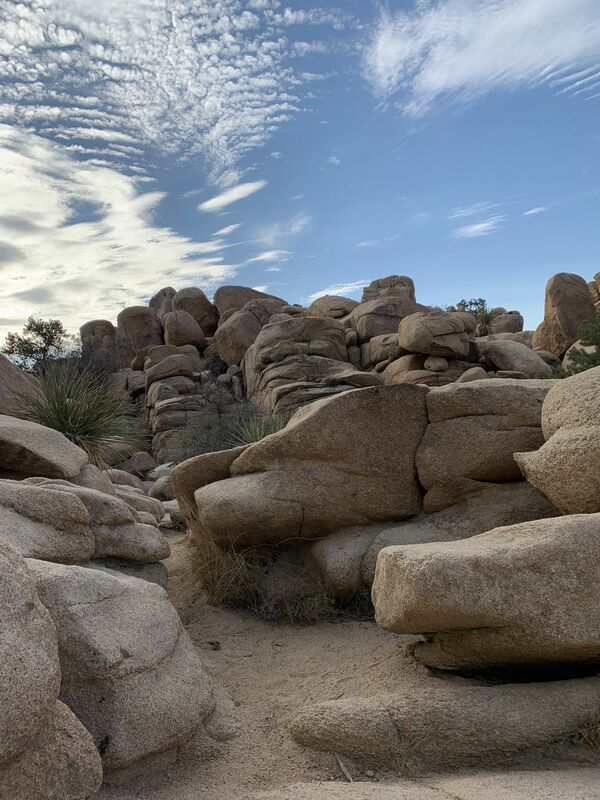 Dykes are signs of a more recent geological process, where another type of molten rock was forced into the cracks in the granite, forming a hard quartz seam. We may call them trees, they may look like trees, but they're really not trees at all. 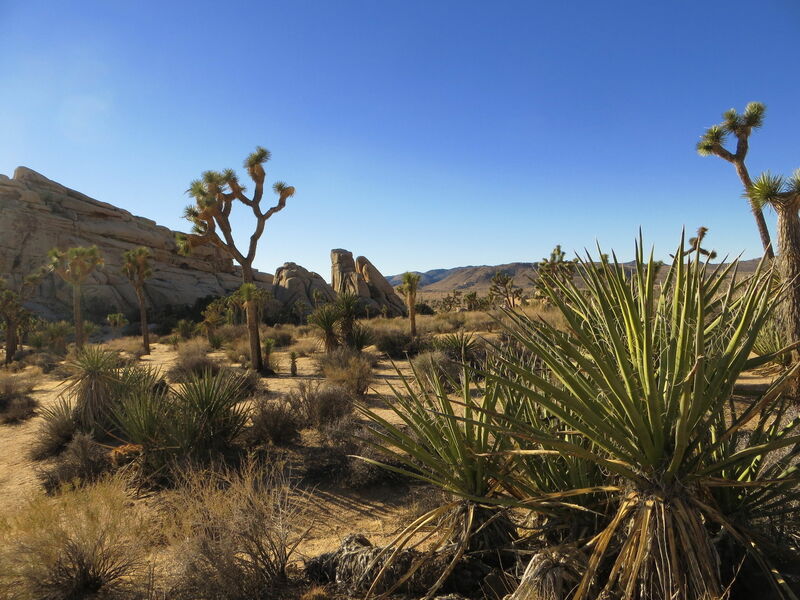 These iconic are actually yucca plants - just really big ones! 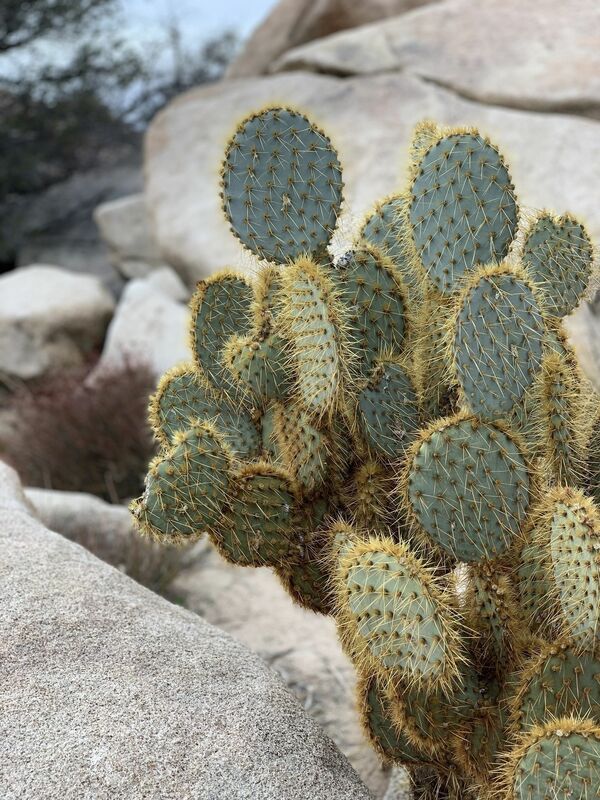 They grow fast, relative to other desert plants, at around 1½ inches each year - growing up to 50 feet tall and living for hundreds and occasionally even thousands of years. 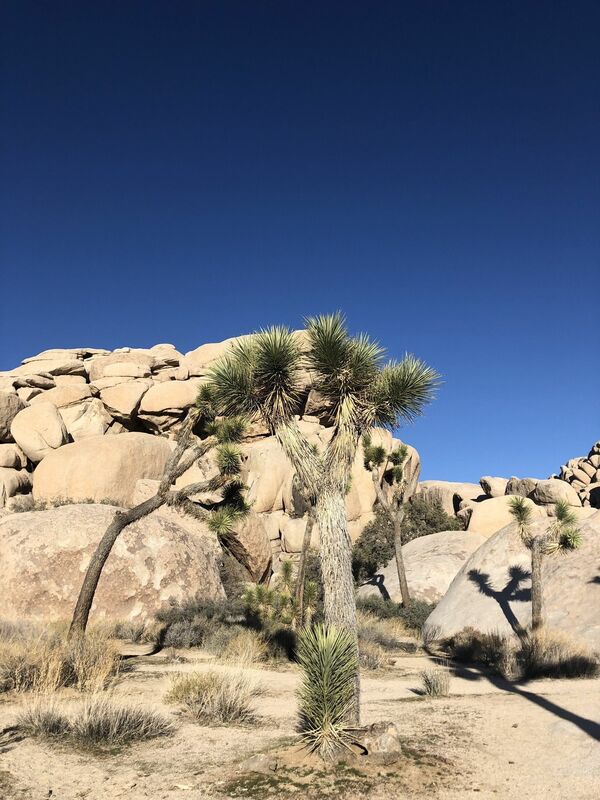 If you're curious about why we call them joshua trees - aside from the fact that it's a much catchier name than yucca brevifolia - it stems from a group of 19th century Mormon settlers who were reminded of biblical accounts of Joshua, thrusting his hands into the air in prayer. - It's wise to remember the sunscreen, protective clothing and water. Thankfully however this is only a short and well marked trail so your dangers to exposure are reduced. 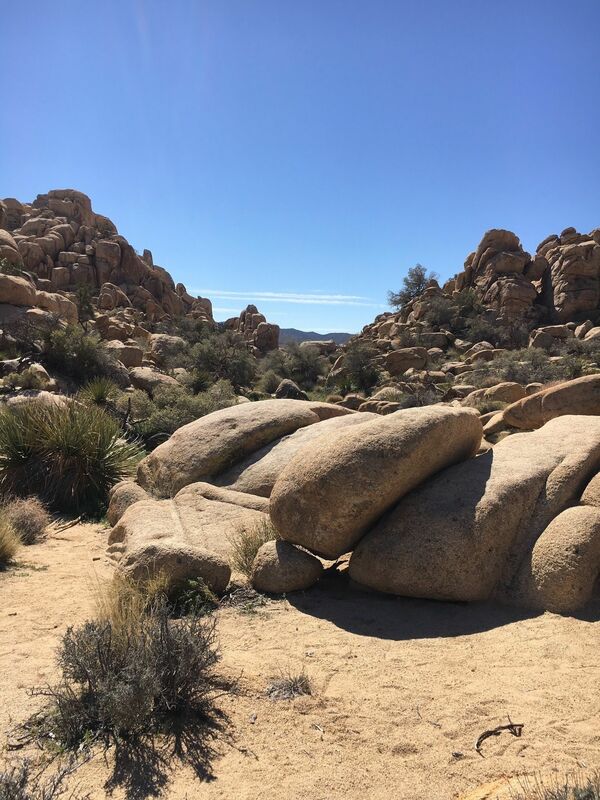 - Some folk like to deviate from the trail and explore deeper into the rocks. Please respect and protect the nature around you if you choose to do so also. 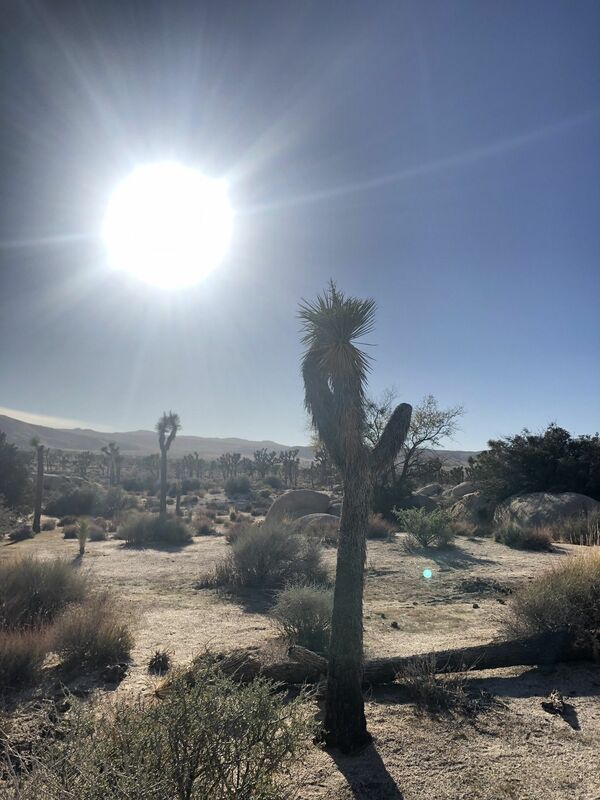 - Seasons: Daytime temperatures vary significantly from 60ºF (15ºC) at winter to over 100ºF (38ºC) in the summer months. Spring and fall are great times to visit, though average daytime temperatures still average around 85ºF (29ºC). 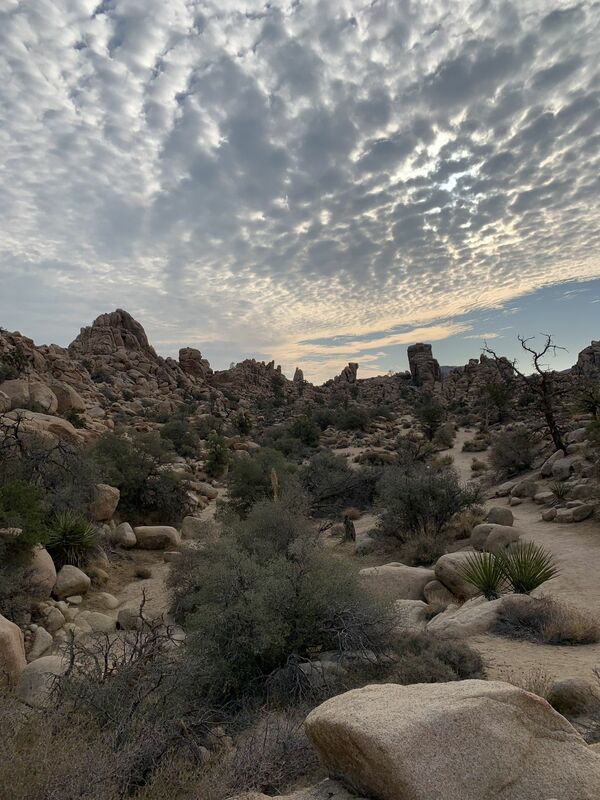 - Contact: Park rangers are available at (760) 367-5500. 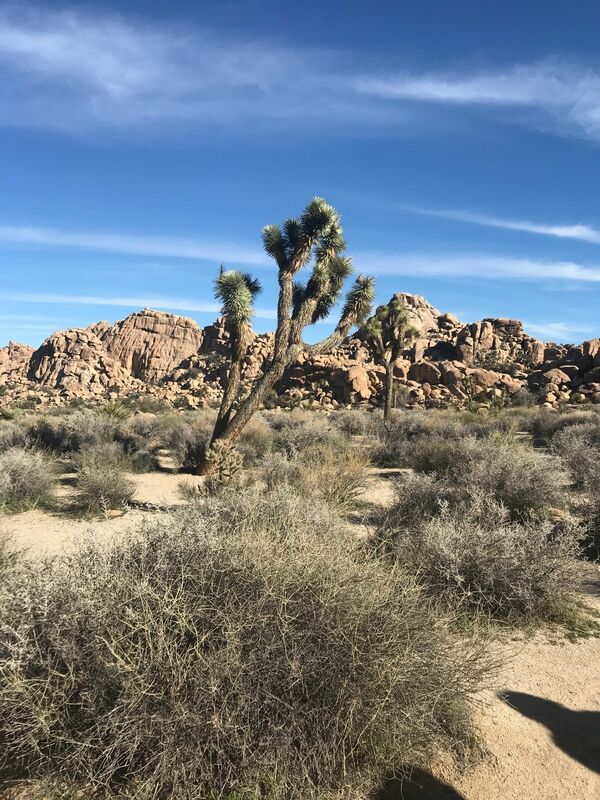 Directions from Oasis Visitor Center: Follow Twentynine Palms Highway (62) westward to Joshua Tree. In Joshua Tree turn left on Park Boulevard, which becomes Quail Springs Road after crossing Alta Loma Drive. Follow Quail Springs Road to the picnic area access road. 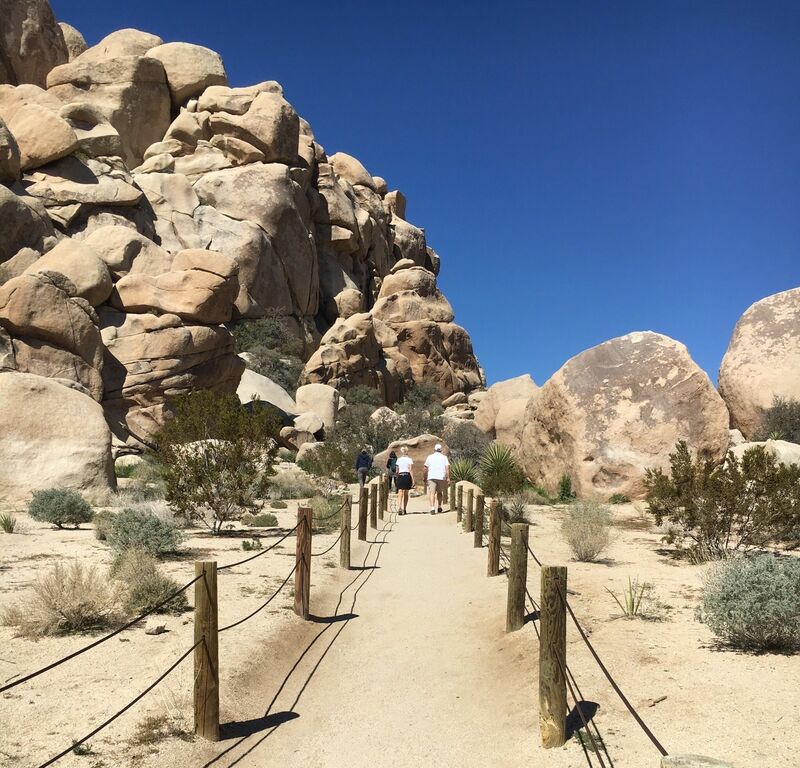 The mileage from Oasis Visitor Center to Hidden Valley Picnic Area is approximately 19.5 miles. 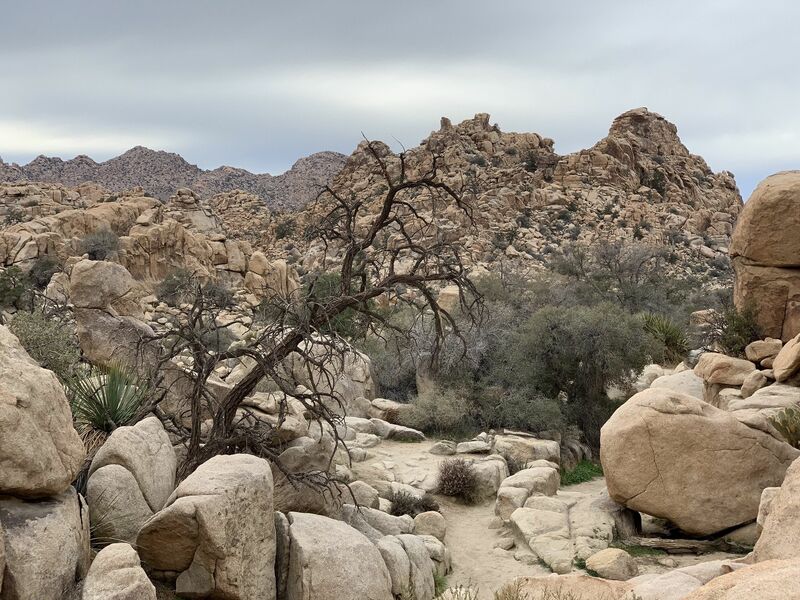 We hiked this stunning loop trail yesterday in the early afternoon. 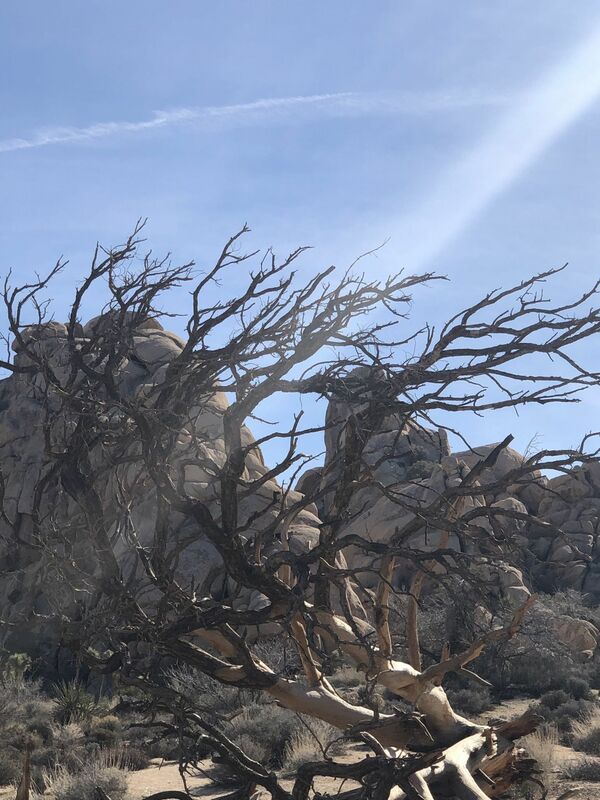 Of all the hikes we did in Joshua Tree the last two days, this was our favorite. The wildflowers this season are in full bloom. 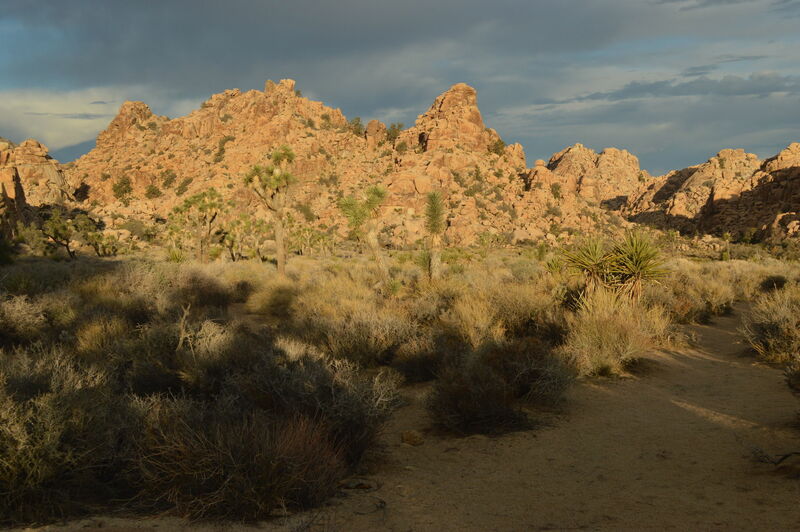 The trail itself is simple but it really shows off all the beauty of the northern half of the park. 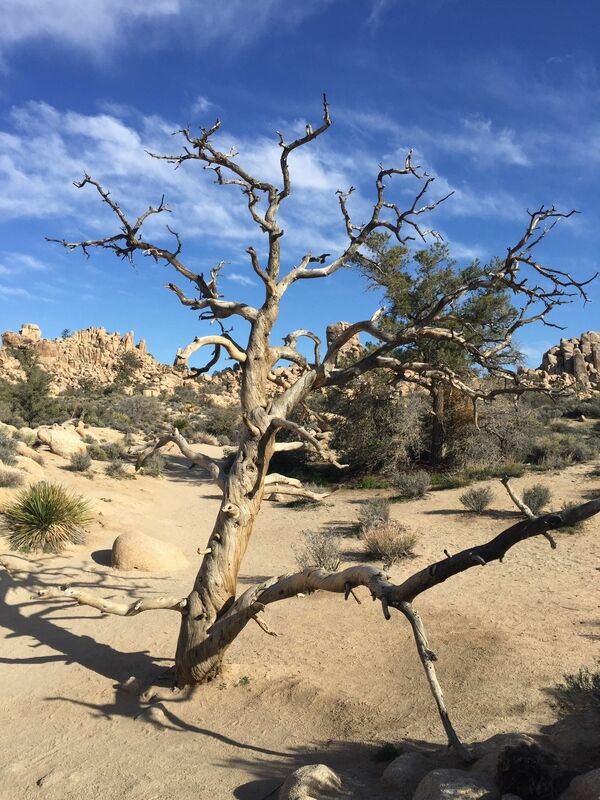 The Joshua trees were so wild and beautiful. 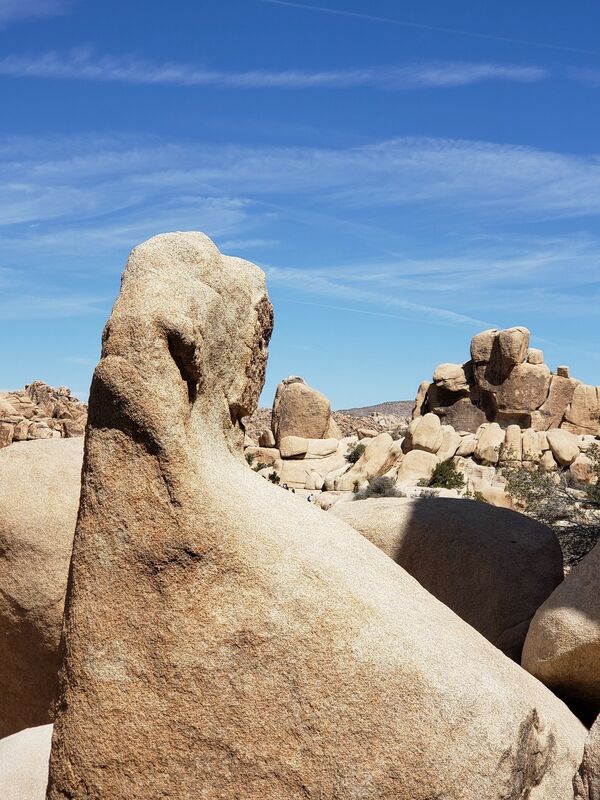 There are also some interesting rock formations to enjoy. A few rock climbers were scaling one of the canyon walls so we stopped to watch them work for a bit. 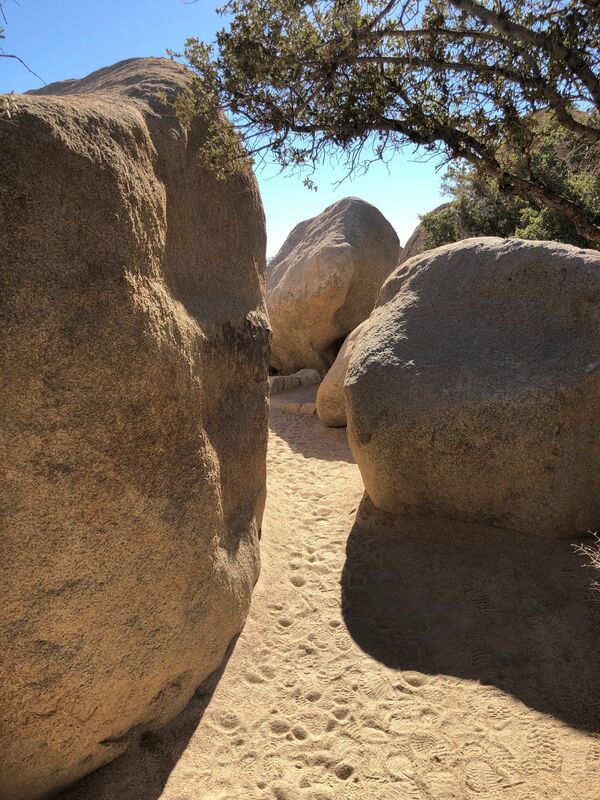 We loved the secluded feel of this trail even though it was crowded with hikers. Don’t miss it. I came here after a morning on Ryan Monutain and it was so nice! 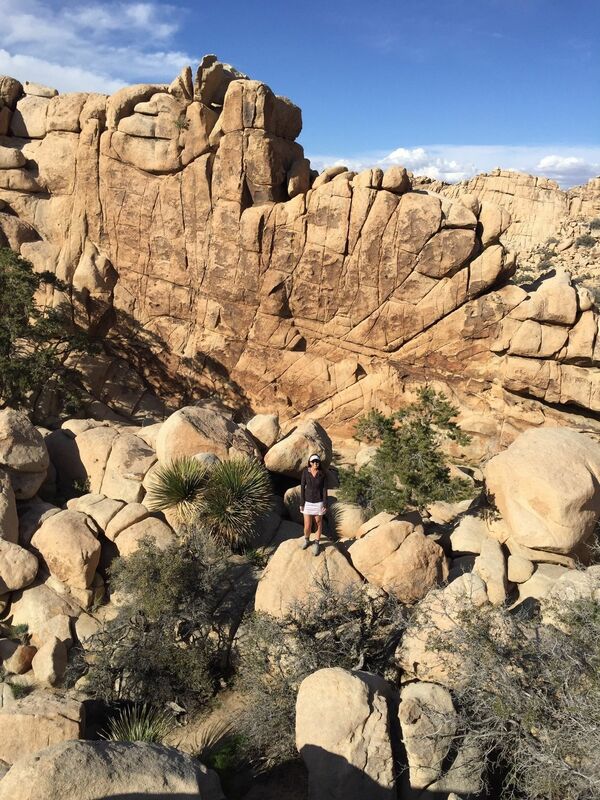 I spent hours bouldering and trying to get up on the larger rock formations. I’d never done anything like that before. For anyone who likes to climb and spend time exploring in a fun, but not super-challenging environment, here’s your place! 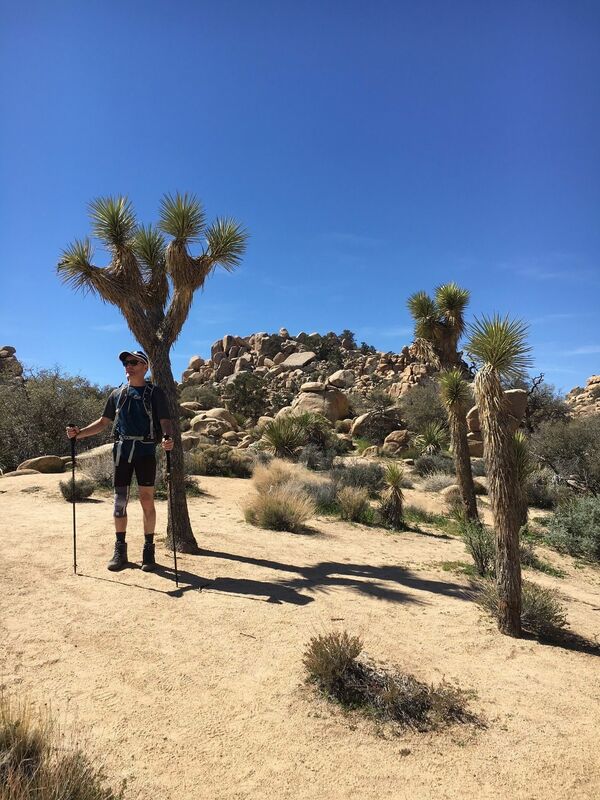 Well marked, some fun rock formations and of course some great Joshua trees! Great trail. 12 yo boys had fun scrambling up rocks and jumping around. Could watch people rock climbing. Good photo ops abound. Trail is easy, with a few rock stairs throughout. Nothing too difficult. 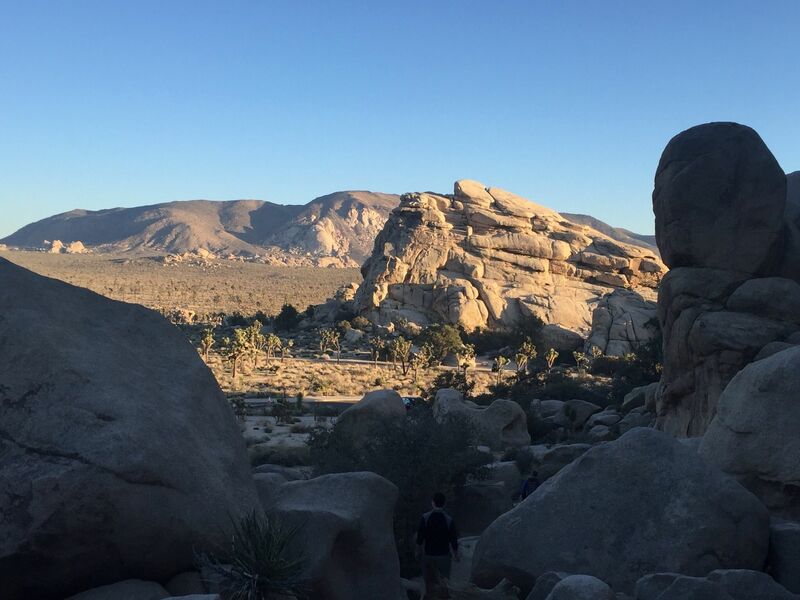 Great rock formations, completely surrounding an open valley. Saw rock climbers along the way. All varieties of plant life here. It was a bit windy outside the valley but calm inside. Parking is directly by the valley access. Would definitely do this easy walk again. If you only do one walk in the park, do this one. Pretty scenery and easy walk. 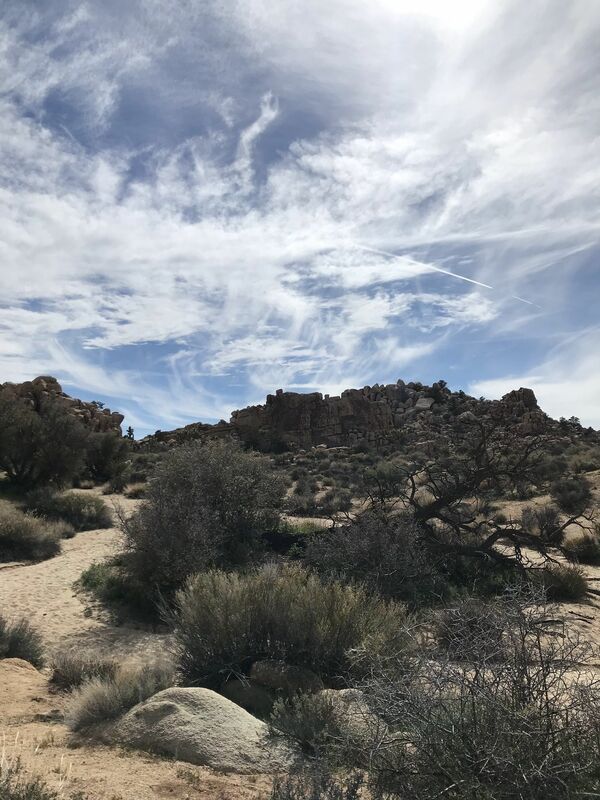 We did as our first hike in the area and it was a great warm up/way to acclimate to the desert landscape. 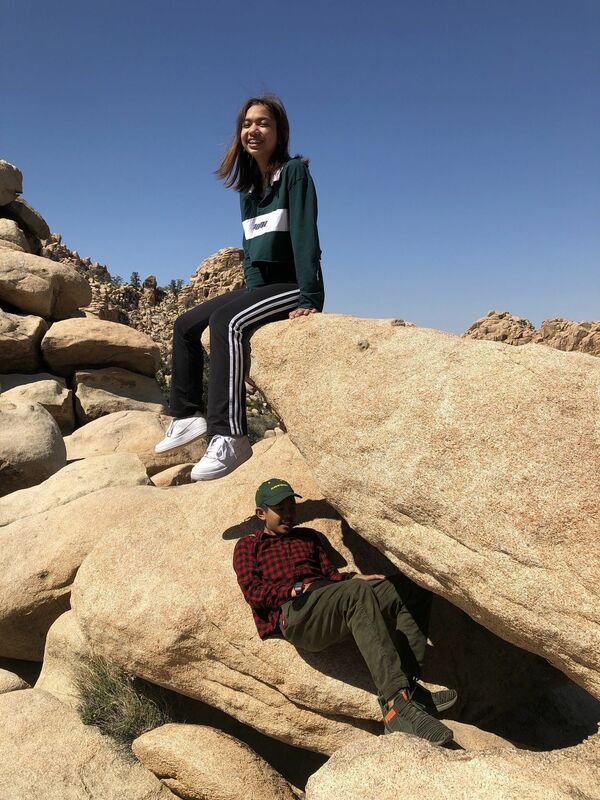 Nice scenery and got to witness rock climbing! Great introduction to the park's geology. Beautiful, easy, short, yet very crowded. Probably my favorite trail in the park. 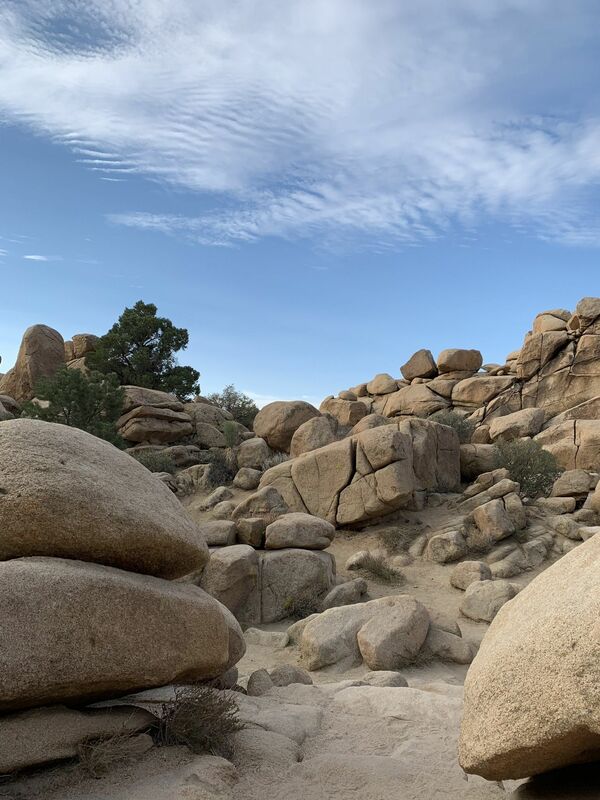 It’s not much of a hike, but the view from being surrounded by rock piles is almost surreal (especially if you go early in the year when there is some snow). 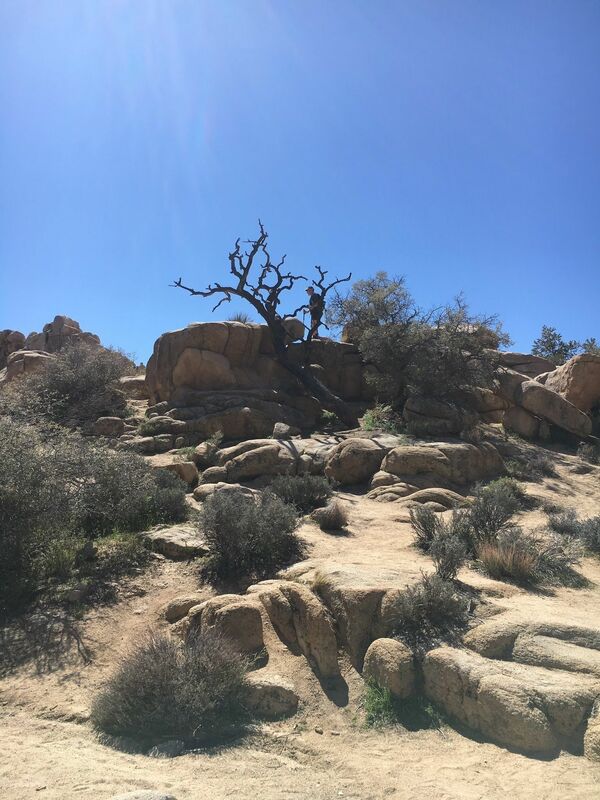 This hike definitely showcases the beauty that Joshua tree has to offer and is great for anyone new to the park! 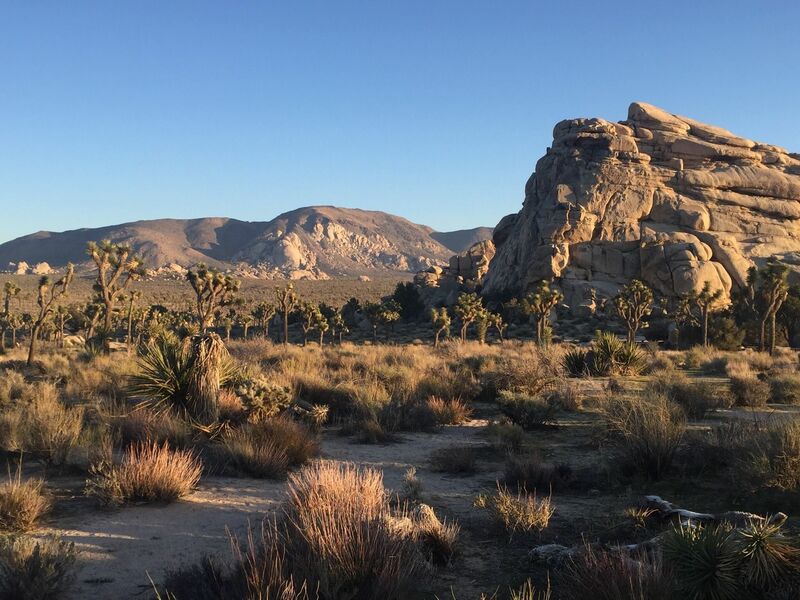 We would not put this on a hike category list - a good trail to see what the park is all about. Easy walking and great photography shots to be had out here. Lots of rock formations which also allowed us to see some climbers. Bad trails markers. Disappointing humans don’t pick up after their four legged animals. A very worthy short walk! Wow how beautiful! Amazing climbing and bouldering too. Super crowded trail. More of an interesting stroll than a hike. 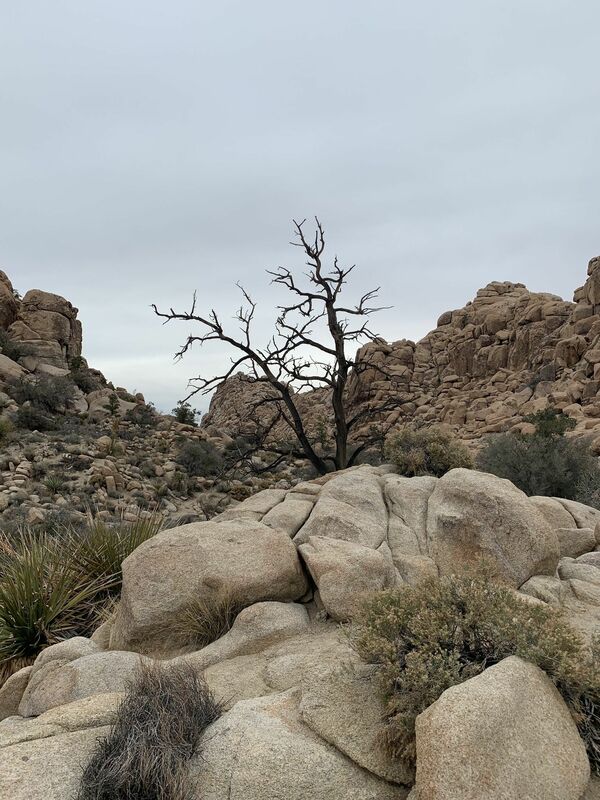 Probably good if you’ve never been to Joshua Tree before, but I found the number of people off-putting. Quite beautiful and not very challenging. There are a few vistas worth checking out. Takes you to a beautiful oasis. At some points, it was kind of hard to follow the trail because it looks like there are trails everywhere, but it’s easy to find your way back. Short loop around the area. 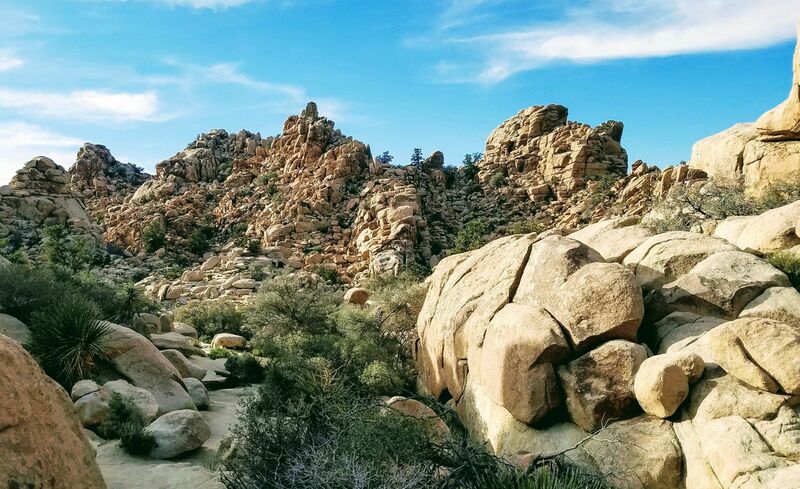 Boulders to climb and play on. Very quick with informative placards. Good for families. Great little loop with the whole family. 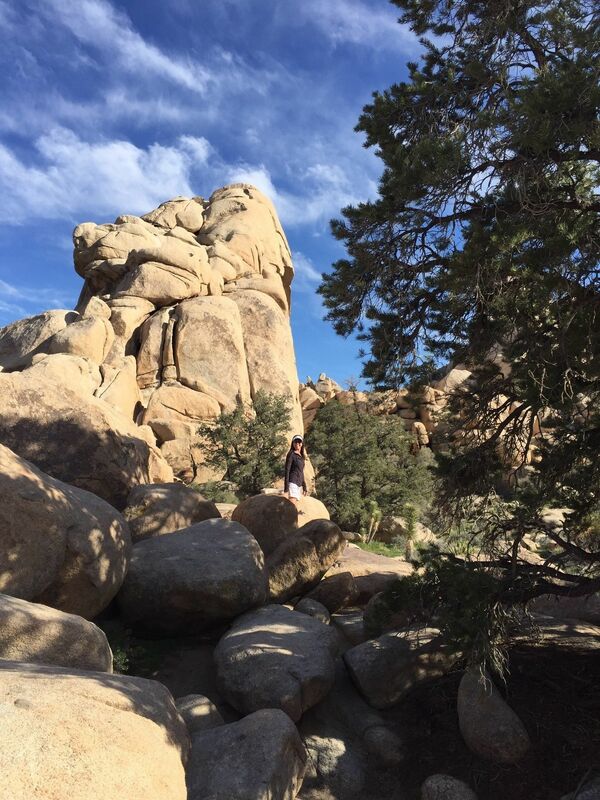 Lots of fun boulders to climb and idyllic picture spots. Really cold and crowded day yesterday. Had to park a half mile away in a pullout because the parking lots nearby were all full. 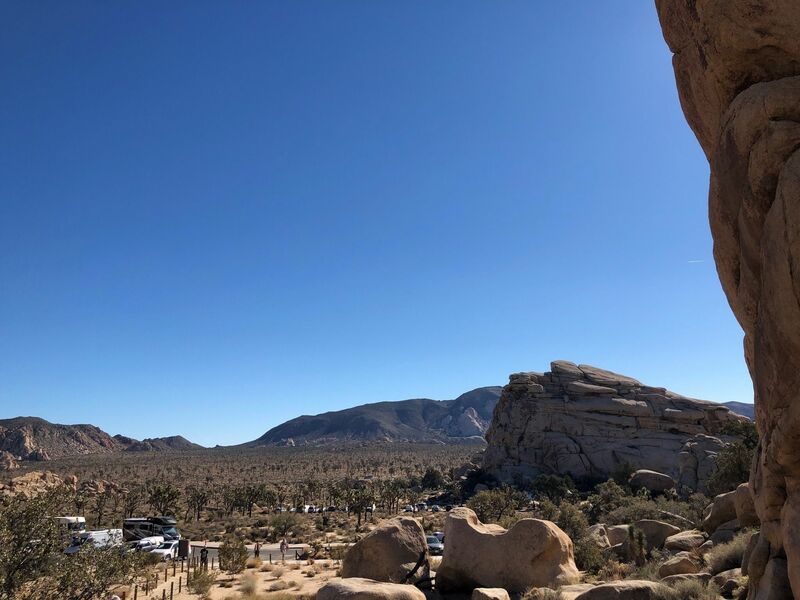 Good intro to the park and some easy bouldering for nice vistas. Don’t choose this if you want to avoid the crowds. Easy and beautiful. No water necessary here because it’s so short. Nice places for easy rock climbing. Extremely popular hike but for good reason. 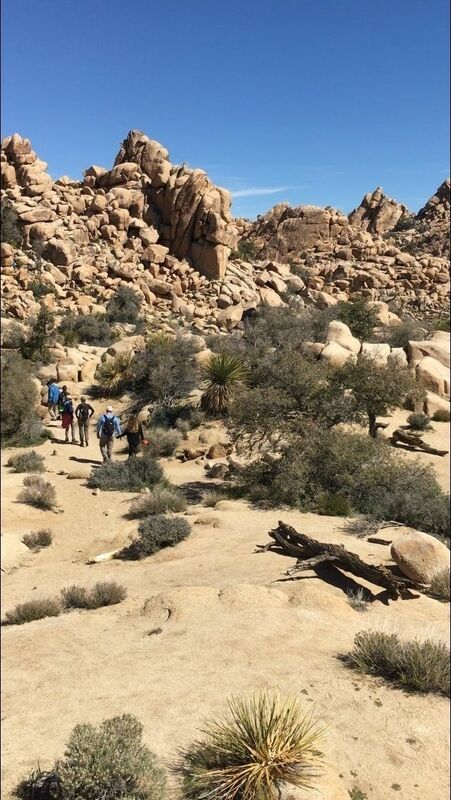 This trail is easy and has a little bit of everything JTNP has to offer. 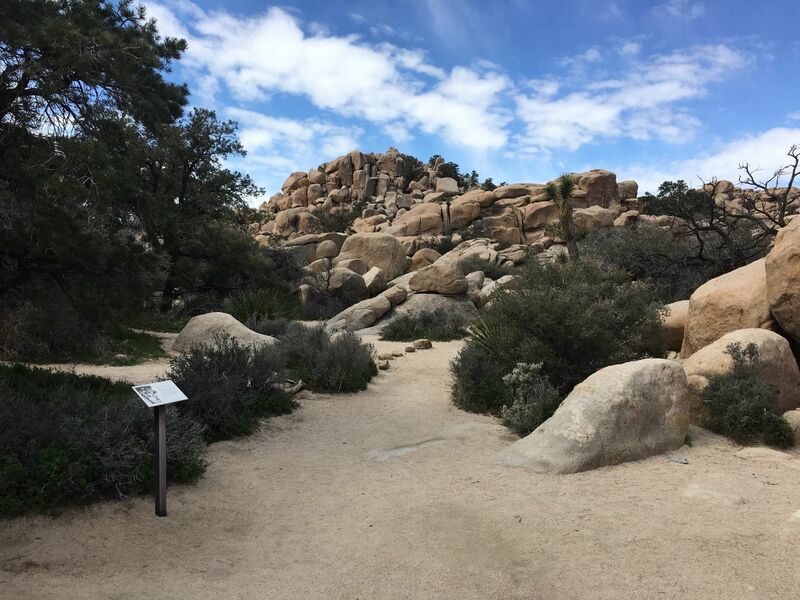 The interesting boulder formations and wide variety of plant life are not only pleasant to look at but thanks to the many educational plaques along the path, you can learn about what you're looking at too. 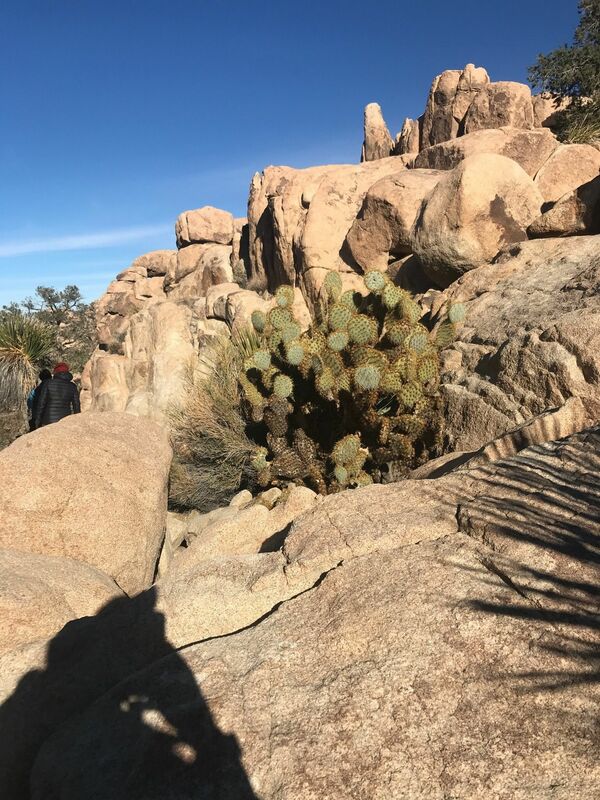 There are no elevated viewpoints unless you are willing to scramble to the top of the rocks, which we saw many people doing, even in jeans and without ideal footwear. 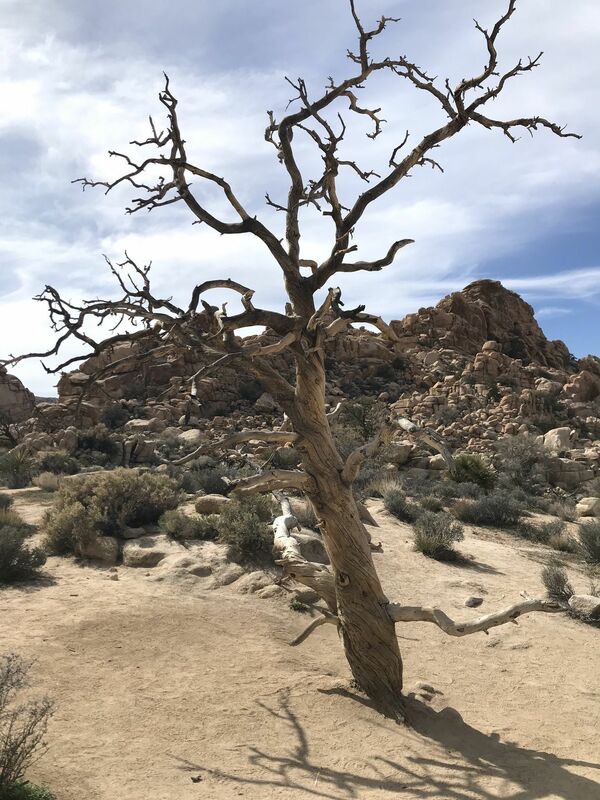 For a short hike, this one offers a lot of value. 1. 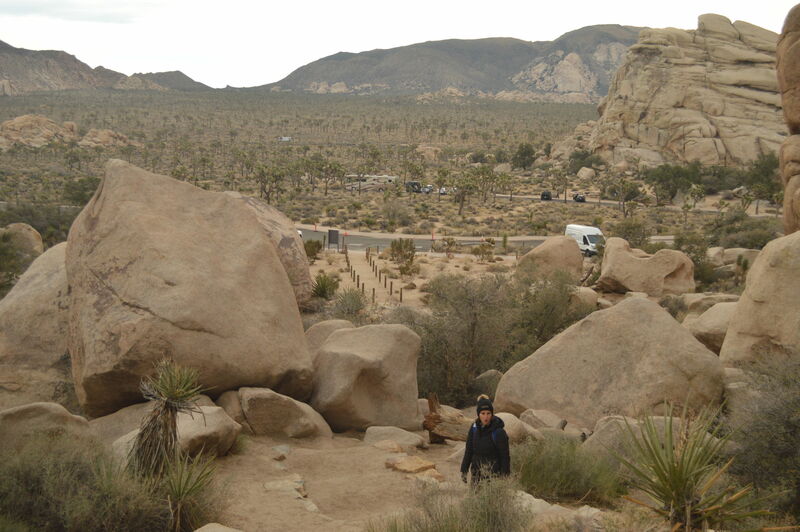 Rock Hopping and Bouldering is available for hours. 2. 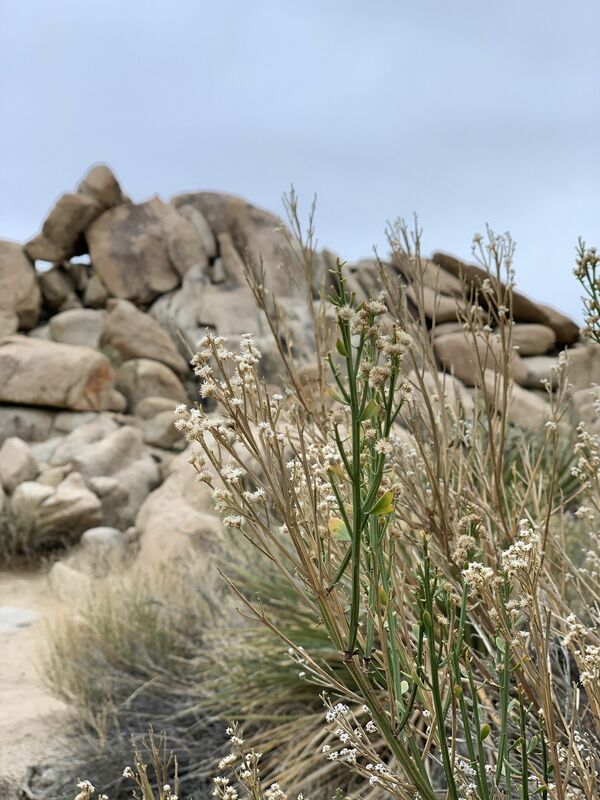 Great diversity of desert plants to see. 3. 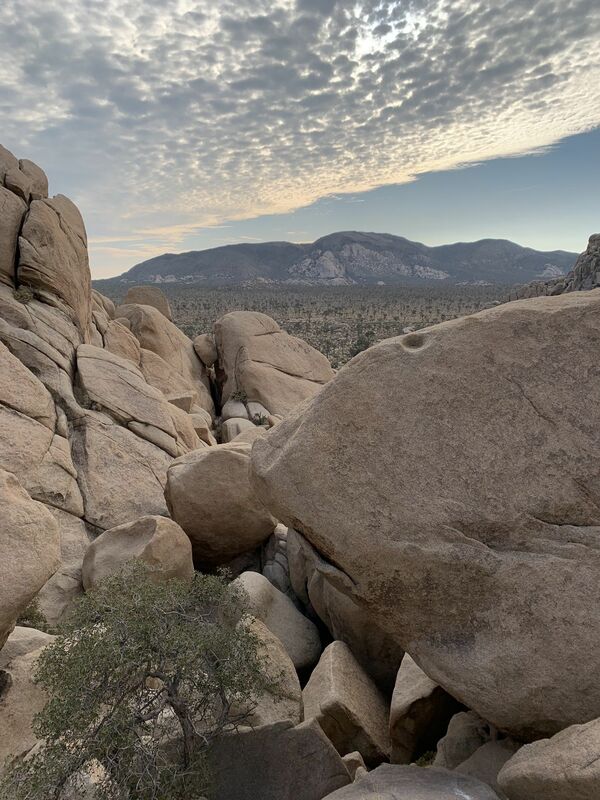 Photography opportunities abound from sunrise to Noon to sunset to overnight, the way the sun can play off the numerous boulders, rock walls, and trees is awesome. 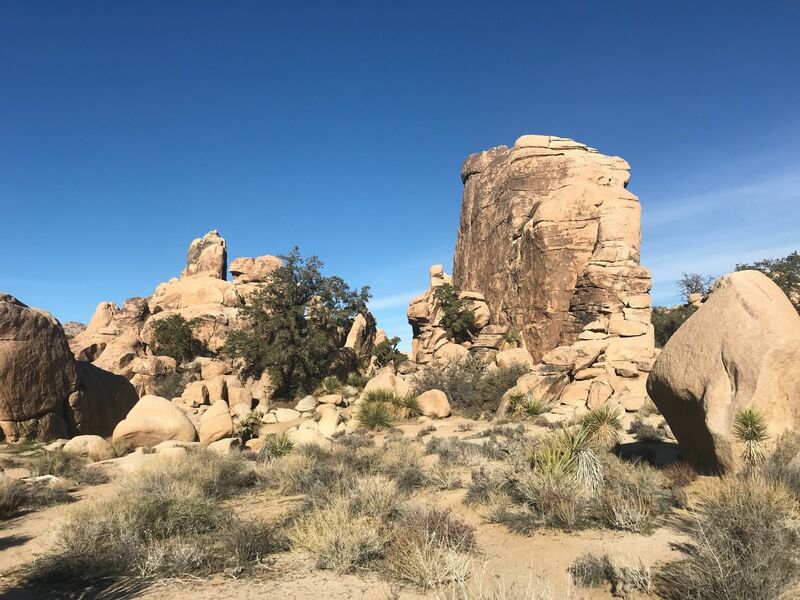 We came early morning in December, temperatures in the upper 30s and very peaceful, I believe my group of 3 had the entire valley to ourselves for the first 1.5 hours. The nature trail winds around and you do need to look for the signs or plant icons along the way to stay on the official trail. Great, easy hike. 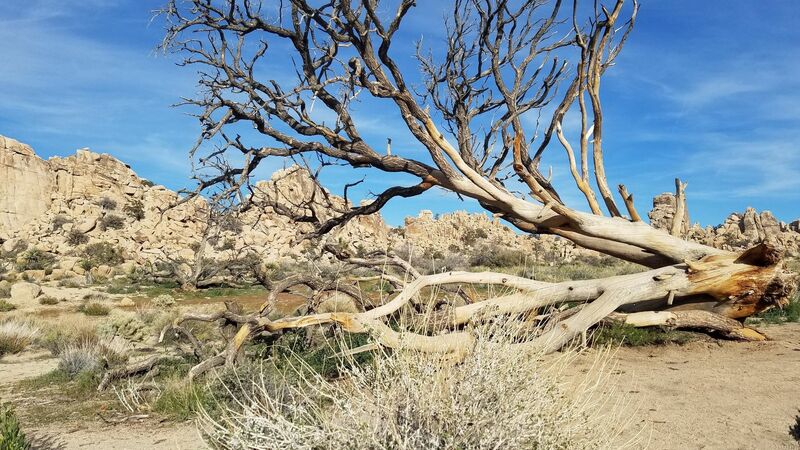 If you’re limited on time and want to get a sampling of the best of Joshua Tree, this is the hike you’ll want to do. 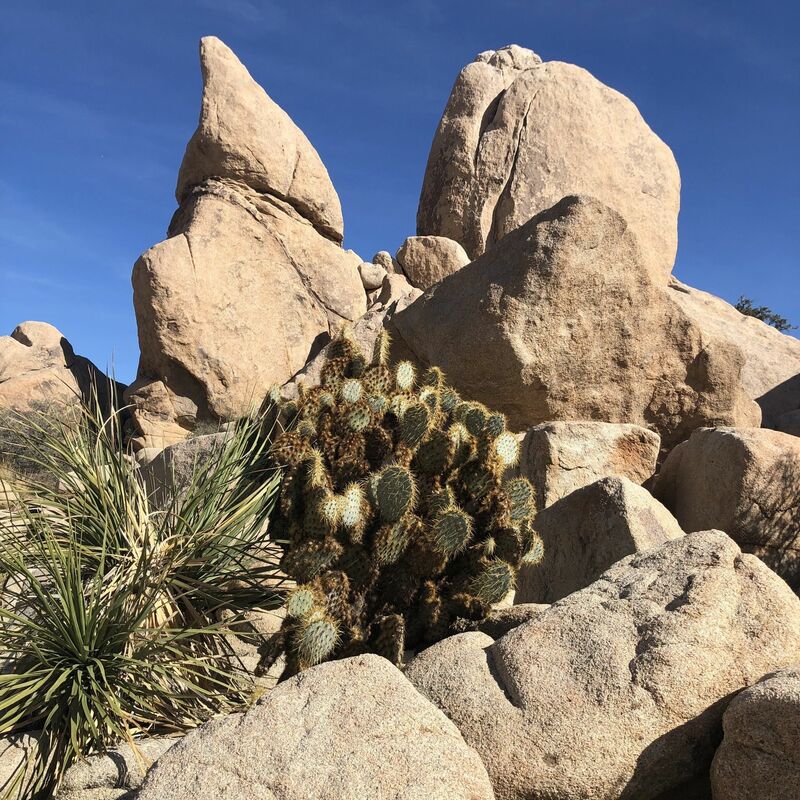 Lots of boulder piles, cacti, Joshua trees, wildlife and more. 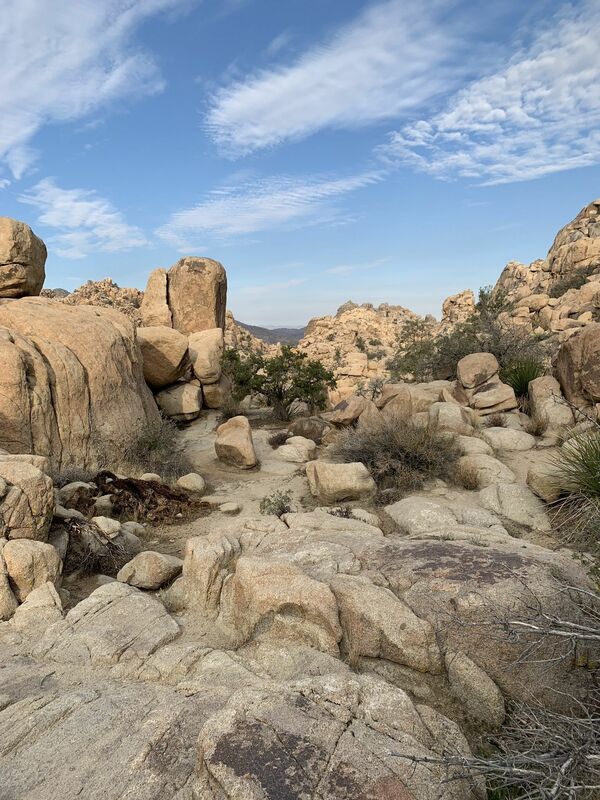 Super scenic, and if want a bit of adventure you can climb and scramble over the boulders. The trail is well-marked and easy to follow. Excellent for newbie hikers or families with kids. 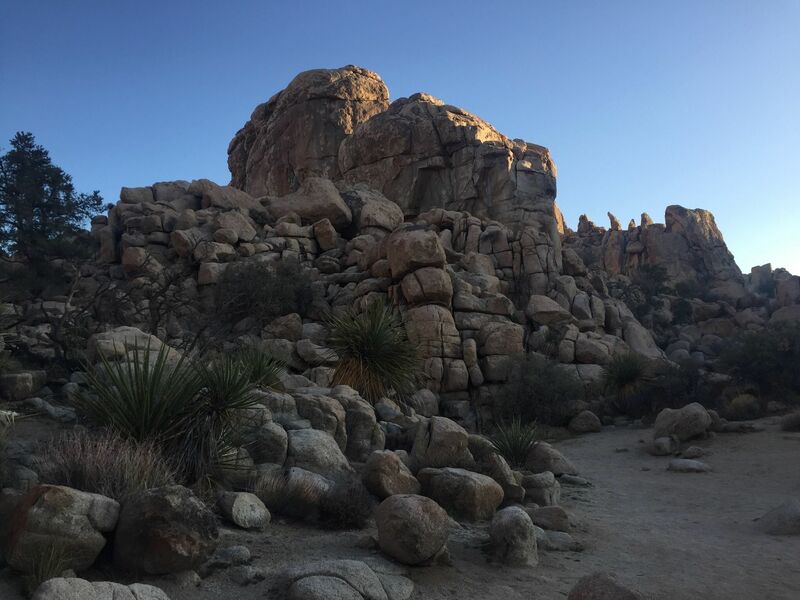 You’ll also see many rock climbers and boulderers in the area. Very easy “walk in the park” type of trail that was absolutely breath taking! 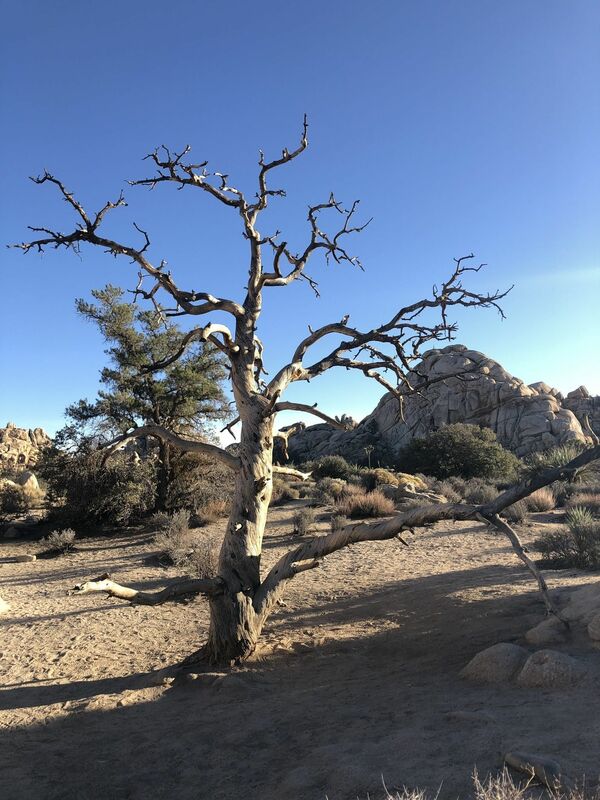 A must see while in Joshua Tree! 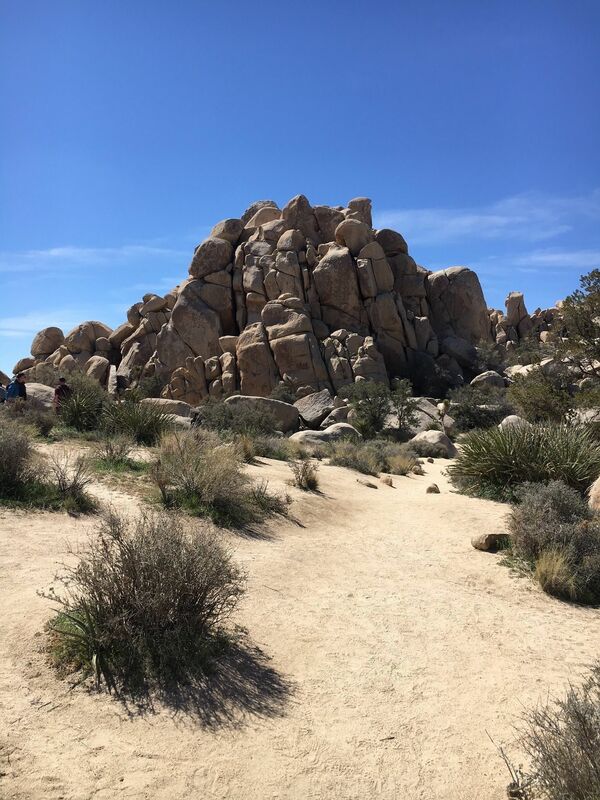 Easy hike to get started. Rewarding and easy one mile hike with lots of different plants. Good signage, though the busy nature of it means that people are all over the place. 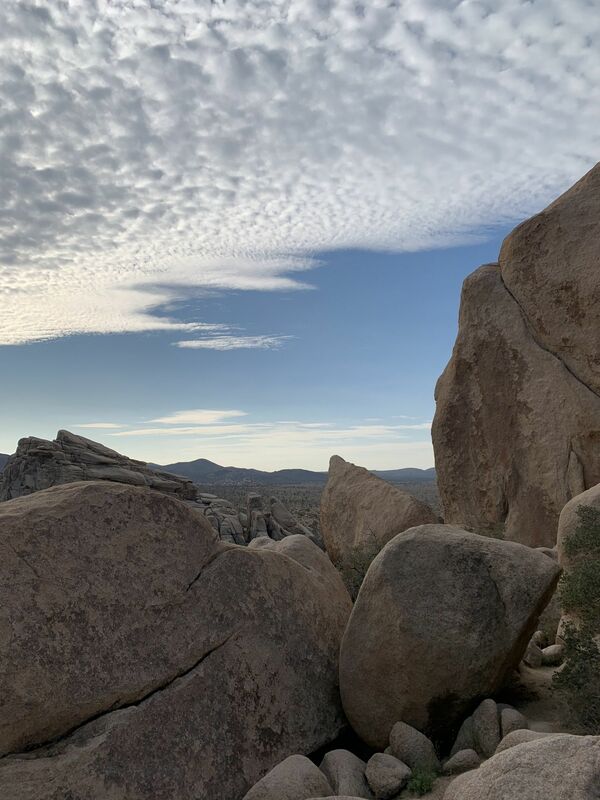 Many rocks to climb on and beautiful views from the top of them! Peter Lee recorded Recording - Apr. 08, 11:47 a.m.